Atlatszo.hu wrote that many students were threatened with being expelled if they wanted to protest. Students dared to share their stories with the journalists only anonymously, as they feared being held back from taking their high school final exams. HVG.hu reported that in December a principal of a high school in Balatonalmádi summoned students to her office and questioned them about their opinion on the protests, taking notes to prepare a report to the county government office. Students of a Budapest high school also wanted to hold a sit-in strike, as many others did in December, but their Facebook event was deleted by a member of the high school student union, who was rather loyal to the school’s staff. The Facebook event had almost 300 “attending” people, and, as in the case of Balatonalmádi, the students of János Xántus Secondary School were also questioned by their principal. According to the students’ account, after the protest held in front of the Hungarian Radio, they were told that they obstructed the education process with their activities, and since they were students they had no right to protest — which was not true, as the grassroots student union HaHa wrote in their legal FAQ for young protesters. 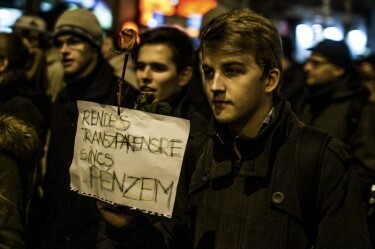 The rose is a reference to Rózsa Hoffmann, the state secretary for education, and the sign of this student protester says: “I don’t have money for a normal banner.” Photo by Peter Nemeth, copyright © Demotix (10/19/2012). Activists of HaHa also had to face the “adults” at a conference-exhibition on education on January 18, where they wanted to pose questions to Rózsa Hoffmann, the state secretary for education. Her policies are so hated among the students that a protest’s title and posters featured puns on her name. On many occasions students took roses with them to the rallies. The demonstration which ended with three students getting arrested in December was titled “Winter Rose Student Revolution” (in Hungarian: Télirózsás Diákforradalom), referring to the state secretary’s first name (rózsa = rose) and borrowing the expression from a Hungarian historical event, the Aster Revolution, since the aster flower is called “autumn rose” in Hungarian. On December 19, students threw roses in the Danube River (video at 3:10) to reject Rózsa Hoffmann’s policies symbolically as well. And when the activists wanted to talk to her in real life, they weren’t allowed to ask questions, so they started shouting their comments to the audience, and some people shouted back that the students should stop criticizing the government’s efforts (a video is here). A woman, allegedly the principal of a Kecskemét city high school, became a meme with her comments; among other things, she said that the activists should have been attending a class at their college at that moment, and before criticizing anything they should first achieve something. Magyar Narancs weekly’s online edition learned that another participant of the conference, who told a HaHa activist to go home and slap his father because he hadn’t educated him on correct behaviour, was the mayor of the village of Nógrádsáp. This post was originally published on Global Voices Online.